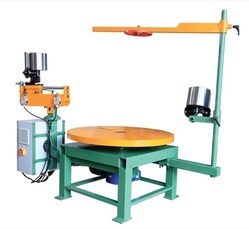 The horizontal decoiler or Pallet Deociler has been designed to be loaded with two to ten coils by pallet, depending upon their width. 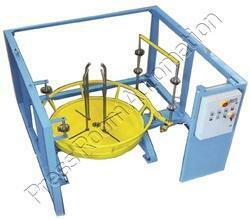 It is versatile machine that handles most press, roll forming, and wire forming applications. A sliding device along with Guiding & Side Railing provides automatic synchronization of the wire decoiler speed variation is made by an inverter. Table with Jaw Expansion to clamp wire. Rugged, all-welded construction for long service life. Regenerative drive with analog proximity switch maintains smooth material payoff & offers consistent speed control. Imported Italian Gearbox along with AC Motor with shock absorbing feature that eliminates material bounce common with other decoiling methods. An Inline Striaghtener can be placed on Horizontal Decoiler Base for High Speed Presses so that you can remove coil curvature of material. Staightener is controlled by Strip Guide with Photo Loop Sensor. Striaghtener has openable head for cleaning of rollers. 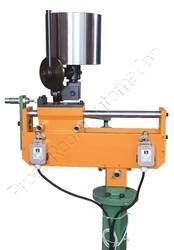 The horizontal decoiler has been designed to be loaded with two to ten coils by pallet, depending upon their width. 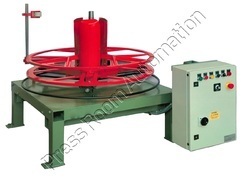 A sliding device upon which a swivelling roller is mounted around which the strip passes before entering the feeder provides automatic synchronization of the strip decoiler speed (up till 36 RMP) speed variation is made by an inverter. Table with cam disc in steel. Coil changing downtime by up to 90% with faster setups and changeovers. Cost Saving Due to Large Diameter Coils with Multiple Coil Loading. Eliminate edge damage and enhance worker safety by eliminating injury caused by lifting and handling heavy coils. Save valuable floor space by eliminating large slack loops associated with vertical decoiler. Load coils easily from front or side. a) Entry & Exit Roller Support System for Width 150 mm. 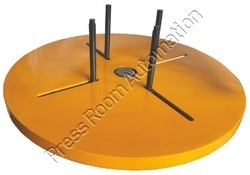 b) Rugged Base in welded steel for mounting various strip guide component along with lifting hooks. c) Entry Width Guide Roller with Back Support Arrangement. Entry Width Guide can be adjusted via Clamping Levers. d) Emergency Stop for Press via Antenna Rod. e) Emergency Stop for Decoiler via Bottom Plate. f) Entry & Exit Roller Support, Ultransonic Sensor, Antenna Rod are all mounted on Aluminum Frame. g) Control Panel consists A. C. Variable high frequency drive for total automation speed variation is done via Ultransonic Sensor in Auto Cycle depending on the distance of the loop. Switches like Manual / Auto, Start / Stop / Inch, Indicator Light On / Off, Pod for Speed Variation are provided. 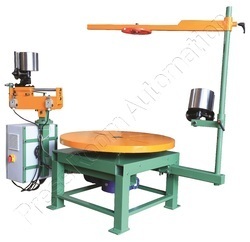 Looking for Horizontal Decoiler or Pallet Decoiler ?